I have been meaning to make homemade pasta for a very long time. I don't know why I've left it so long since I am obsessed with pasta. I even got a pasta machine for Christmas 2010! - Place the flour on a clean counter top or bowl. Make a well in the center and break the eggs into the well. Using a fork, beat the eggs, gradually pulling in the flour until the dough begins to form a homogeneous mass. - Dust the work surface with flour and begin kneading the pasta dough. 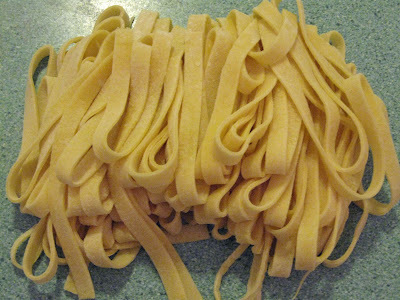 - Roll out the dough using a roller pasta machine (as per the machine's instructions). Keep the dough dusted lightly with flour at all times to prevent from sticking. Fold up and roll a second time and put through the roller again a couple times until it becomes smooth. Continue to roll each sheet, gradually decreasing the setting until you've reach the desired thickness.